Three-time defending Tour de France champion Chris Froome failed a doping test at the Vuelta a España this September and is facing a potential year-long suspension from cycling, as the Guardian first reported today. Froome, the most dominant cyclist of the past decade and the winner of four Tours and one Vuelta, tested positive for the asthma drug salbutamol (more commonly known as albuterol) on Sept. 7. 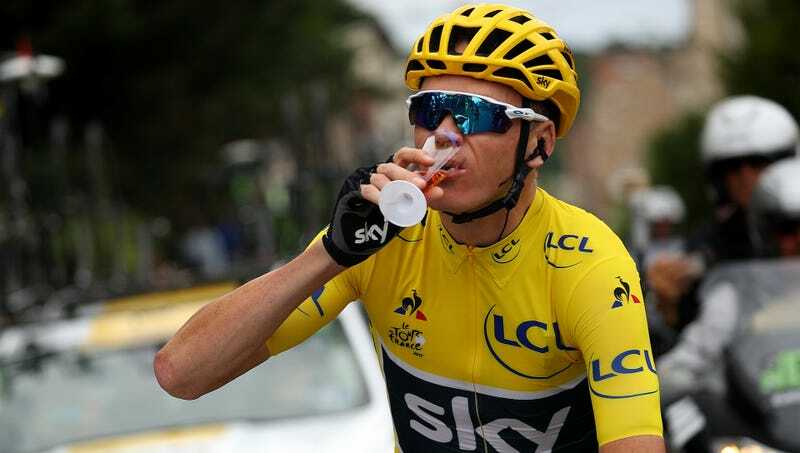 Froome’s asthma has been a matter of public record for years now, although his A and B samples both showed twice the legally allowed amount of albuterol. The British rider and Team Sky are challenging the UCI’s ruling, and they claim that Froome’s asthma flared up during the race which forced the team’s doctor to raise his dosage. “I take my leadership position in my sport very seriously. The UCI is absolutely right to examine test results and, together with the team, I will provide whatever information it requires,” he said. Albuterol relaxes the muscles around the bronchial tubes, which allows asthmatic athletes to breathe normally or non-asthmatic athletes to breathe easier. Because Froome has a therapeutic use exemption for his asthma, he has not been provisionally suspended and will not be disciplined unless the UCI’s investigation finds his explanation insufficient. If he is found to have violated anti-doping regulations, he could be stripped of his Vuelta title and miss next year’s Tour de France, where he has a shot to enter a five-way tie for most Tour titles with five (non-Lance division). He’s already 32, and missing one in his prime could potentially be devastating. In 2007, Italian sprinter Alessandro Petacchi popped a positive for albuterol and was stripped of five stage victories at the Giro d’Italia and suspended for a year.